“Following last year's amazing festival we knew we had to deliver. We have one of the only shows from TOOL in 2018, a band the Rangers have been wanting for years -- and also having A PERFECT CIRCLE on the same festival is something special. Adding AVENGED SEVENFOLD, ALICE IN CHAINS, GODSMACK, and the special returns of STONE SOUR and STONE TEMPLE PILOTS only builds on that excitement. 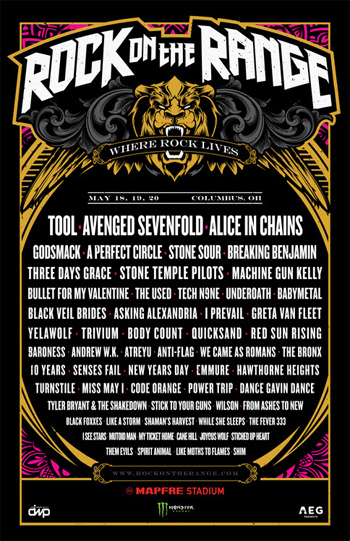 We can’t wait for May,” said Gary Spivack, Executive Producer for Rock On The Range.